In the recent story over at Foot's Forecast out of State College, Pennsylvania simply titled "Hurricane X" we're told the potential economic costs of Hurricane Irma could be absolutely staggering in Florida alone with their estimate of between $200 and $300 BILLION when it is realized that large portions of downtown Miami, slated previously to be in the eyewall, may receive higher elevation winds of 150 mph + for 6-12 hours where high rises reach 300 feet or more. While Accuweather currently estimates potential economic costs from Hurricane Irma in the U.S. will be in the $50-100 billion range, they added this disclaimer: "If the eye passes right over Miami, then it will be even more." HURRICANE X... ...is the beyond catastrophic, no win scenario for Florida and Georgia. The landfall and aftermath of a Category 5 striking a major city, and then directly impacting several cities in rapid succession, will be a watershed event in American history. ...is the extreme "nuclear nightmare" of the same storm striking BOTH Miami AND Savannah, which is so outlandish it may have no parallel in known climatology. 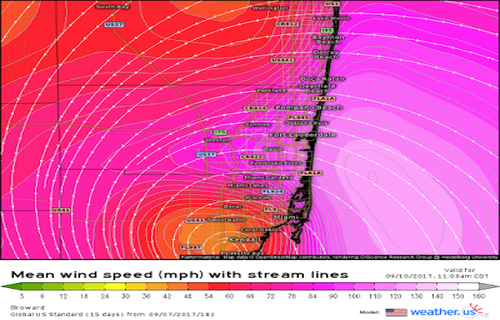 The map seen above from Lake Worth to Palmetto Bay, Florida shows projected mean wind speeds for Sunday morning 9/10. Think carefully about this: If the mean wind is 130-140 mph, what are the gusts? What traditional structure is designed to withstand that kind of force for 6-12 hours? MODELS SHOWING BEYOND WORST CASE SCENARIO THAT UNTIL NOW ONLY EXISTED IN EMERGENCY MANAGEMENT PLANNING. Category 4 or 5 storm with 10-15 feet of surge raking several hundred miles of densely populated coastline with tens of billions of dollars in property value. LANDFALL JUST SOUTH OF MIAMI would ads to an inland track with 120-150 mph winds on the east side that will damage or destroy over 50% of all structures in an area containing over 6 million people. BISECTING THE STATE on a track just west of I-95 will bring the core of strongest winds over hundreds of square miles of critical transportation and infrastructure resources. 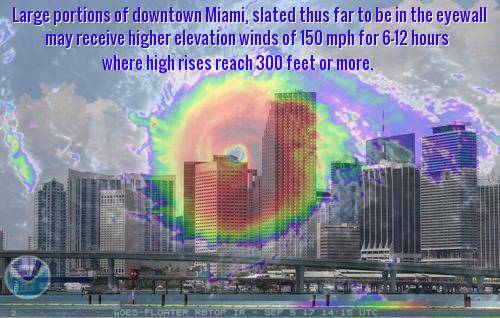 200-300 BILLION DOLLAR COST when it is realized that large portions of downtown Miami, slated thus far to be in the eyewall, may receive higher elevation winds of 150 mph + for 6-12 hours where high rises reach 300 feet or more. As we enter a time of unprecedented destruction in America and the world, hurricane Irma coming on the heels of a massive, 8.1 earthquake in Mexico that set off tsunami beacons all across the ring of fire being just the latest signs we're now witnessing truly historical events, we see in this warning from Foot's that huge change may be coming to some of the people of Florida with expected damage including large parts of the power grid being taken down, schools closed for 3 to 6 months if not longer, stores completely demolished, widespread flooding and huge numbers of homeless as homes and apartment buildings are completely destroyed. As even the Associated Press reported in this new story, we're now witnessing a 'nutty run of nature' with winds, fires, floods and quakes - so what more awaits us? We're truly living in absolutely amazing times! Large portions of the power grid may need reconstructing in areas where winds exceed 120 mph east of Lake Ockeechobee to the coast and south to Miami. Schools will be heavily damaged or destroyed over dozens of counties, and unavailable for 3-6 months. Alternate structures that would have housed students from a displaced school will also be destroyed. The inland danger of rainwater overtopping leeves and flooding lakes is easily overlooked, until you consider how the 1928 "Forgotten Hurricane" killed at least 2,500 people just in the Lake Okeechobee area from a storm less powerful than Irma. Rescue efforts were hampered by thousands of snakes which had been deposited in trees by the wind and waves of the Lake. Large resupply locations such as big box stores will have their roofs demolished, torn off or completely destroyed, with major damage to interior contents. This will severely hamper recovery efforts as locations to house and protect supplies will be limited due to the widespread damage to available buildings. 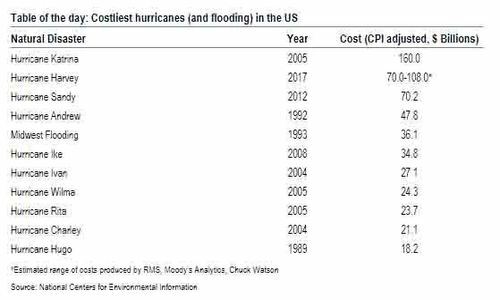 According to this new story from Zero Hedge, hurricane Harvey may end up being the most expensive natural disaster in US history with the chart above showing current numbers showing Harvey now right behind Hurricane Katrina and much more damage still yet to be determined. And if the estimates were now seeing being thrown around for Irma are correct, those catastrophe numbers could end up dwarfing those of Harvey and Katrina. Yet as Florida Governor Rick Scott correctly says, homes can be replaced but human beings cannot and the losses from untold deaths and injuries will far outweight the economic costs in human suffering. According to this story from CBS Miami, 4.1 million electricity customers are expected to lose power in Florida, that translating into about 9 million people! When you consider that Florida's 2010 population was 18 million, we see that expectations are nearly 1 in every 2 customers may lose power for lengthy periods of time if the entire electrical grid needs to be rebuilt. In the first video below, Mike Adams of Natural News asks if we're now witnessing end times approaching with massive natural disasters from coast to coast. The 2nd video below takes a look at the possible economic costs of Irma while the final video below called "Final Hour 140 - Irma, Destruction And Judgment - Watchman Sounding The Alarm" takes a look at hurricane Irma from the viewpoint of Biblical prophecy. With Irma expected to come crashing ashore in less than a day, we pray for the good people of Florida. We pray for America.